Indiana Jones and the Kingdom of the Crystal Skull was released on DVD this week. 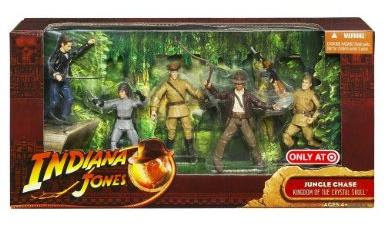 As part of roll-out, Target stores have debuted 3 exclusive Battle Packs of Indiana Jones action figures reenacting famous scenes from the movies. 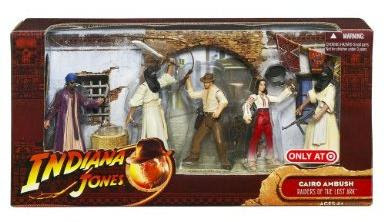 The Tank Showdown set pictured above is notable because it includes one of the most popular (and hardest to find) figures in the series, Dr. Henry Jones. Each set costs $15.99 each and includes 5 figures. 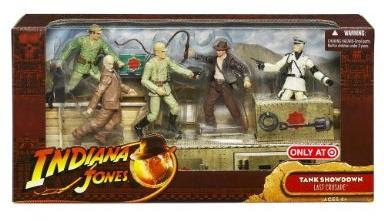 As a reminder, this line from Hasbro has been canceled following the current Temple of Doom wave.